Incredible way to kick things off tonight, with two tag teams who have great chemistry as opponents. 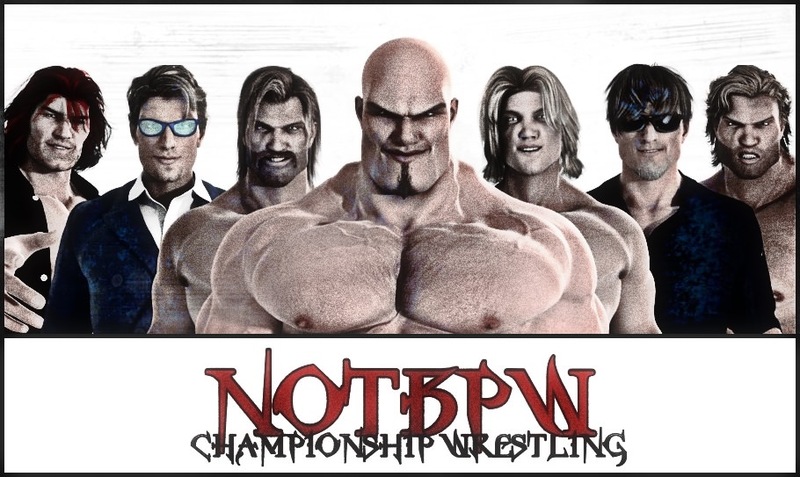 Dan DaLay and Derek Frost have been wrestling a long time, but they were up against youngsters who also posses bags of experience in Cameron Vessey and Christian Price! Vessey and Price also have Cameron's Uncle Bryan Vessey, and their friends Edd Stone and Tim Westybrook, who all showed up late on to 'support' their friends. Robin DaLay tried to stop them getting involved, but he couldn't stop them all on his own. For the finish, Derek Frost was caught with Christian Price's 'Stud Stopper' Stunner after the veteran was distracted by antics on the outside of the ring, and we had new Tag Team Champions!! After the match, a battered and bruised Dan DaLay grabbed a microphone... He had something to say to Alex DeColt, and his brother Jack DeColt, after the events of last week... DaLay's tag team partner Derek Frost, and his son Robin DaLay tried to stop him... They knew what trouble Dan's big mouth had gotten them all into in the past... They all got fired six months ago by Alex due to Dan's words and actions... Tonight though, he really wanted to speak to Jack DeColt!! Time for some 'tough love' from Sean Deeley here, as he took on his young protege Ernest Youngman in order to teach the 24 year old a lesson after some constant losses and disappointments. However, Deeley didn't account for Ernest Youngman fighting back and getting his shots in. 'The Shooter' thought he'd just beat Youngman up for a few minutes, but Youngman had other ideas. For the finish, Deeley got cocky, and he walked onto 'The Hit'! He flew across the ring and landed hard against the ropes. The crowd begged Youngman to cover his mentor, and he did, to score a historic victory! Gino Montero and Luis Montero Jr. made a huge challenge last week, promising to take down The DeColt Empire by defeating Steve DeColt and Ricky DeColt at October Obliteration. Steve and Ricky are yet to accept the challenge, but if they do, it'll be a historic match! Tonight's effort against Lord James King and Hugh Ancrie was a formality really. King lead things for his team, and ordered the young Ancrie around. Late on, King went for his Brass Knuckles, but Luis Montero Jr. super kicked them off of his fist! Gino Montero then hit his 'Desinty Explosion' finisher on King and scored the victory! Following an attack by Mayhem on Solomon Gold two weeks ago, Alex DeColt agreed to let Gold and The Natural take on Aldous Blackfriar and Mutant here. Aldous defeated The Natural a fortnight ago in a singles contest, but tonight, the veteran had his charismatic young tag team partner on the apron when he needed him! However, anyone coming up against Mutant at the moment, is coming up against an immovable brick wall! For the finish, Mutant sent Solomon Gold flying with a Brick Wall Clothesline that he calls 'The Tina Turner', and then Aldous locked him in the 'Batwing'! This match was on its way to being a very good one. Two fan favourites in Trent Shaffer and Thrill Seeker, who need a break due to a rough 2017 for various reasons. Shaffer has only just come back after a career threatening injury, and Seeker's tag team partner Jacob Jett is also facing a lengthy spell on the shelf at the moment. They both fought hard here, but in the end, Edd Stone, Tim Westybrook, Bryan Vessey, Cameron Vessey and Christian Price hit the ring and the referee called the match a draw! The first thing Bryan Vessey and Tim Westybrook did was pull Thrill Seeker out of the ring, and slam him into the barricade... Edd Stone then told Cameron Vessey and Christian Price that NOW was their time to make Trent Shaffer pay for his comments earlier in the show... 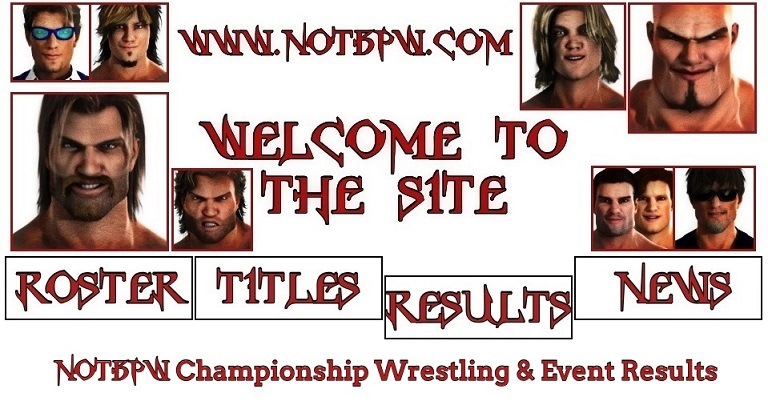 The new NOTBPW Tag Team Champions slid into the ring to attack, but Shaffer sent Price flying out over the top rope!! Cameron Vessey then walked onto a super kick, and he too fell out of the ring... Edd Stone slowly climbed onto the apron... glaring at Shaffer... But it was 'The Enforcer' Tim Westybrook and Bryan Vessey that slid in behind Shaffer that made an impact... In fact, Westybrook might have made a dent in the back of Shaffer's head!! The 2 on 1 assault didn't last long, because Thrill Seeker climbed the top rope, and delivered a flying cross-body to take Tim Westybrook and Bryan Vessey down!! Christian Price and Cameron Vessey got back into the ring next though, and with Edd Stone's help, the beatdown continued... Bryan Vessey slid to the outside though, and he looked like he'd been hurt by the flying Thrill Seeker... Even without Bryan Vessey, it was still 4 on 2... and when one of the 4 is the 290lb beast Tim Westybrook, it was a very uneven fight... Things got a little bit more even though, when Aaron Andrews' music hit, and 'The Ace' made his presence felt!! Aaron Andrews' night was far from over, because 'The Ace' was in action in tonight's Main Event against Angry Gilmore. Gilmore came up short in his last outing, as he took on 'The Monster' Gargantuan at The Scramble, so tonight he was determined to make up for it. He was up against a man who wouldn't stay down though in Aaron Andrews, and 'The Ace' took every stiff shot Gilmore threw his way! A vicious elbow late on staggered Andrews, and he was then hit with a brilliant bone shattering Spine Buster. Gilmore headed to the top rope, where he looked to hit his 'Sky High Elbow', but Andrews rushed to join him and attempted a superplex! But Gilmore delivered another stiff elbow strike, and Andrews fell backwards slowly, dropping into the perfect position. The perfect position, for Gilmore to drop from the sky and hit his 'Sky High Elbow' finisher! Angry Gilmore didn't like what he was hearing, and once Danny Cavanagh had come to a natural end, he got on the microphone again, and asked if Cav was finished... Cavanagh said yes... Gilmore said that perhaps 'Mighty' Cavanagh wants to put his money where his mouth is... Perhaps Cavanagh and Gilmore could go 1 on 1 next week... Since Cavanagh thinks HE can beat Gargantuan, and Gilmore can't... Gilmore even suggested that if Cavanagh CAN win, Gilmore would step aside and let the big man take 'The Monster' on at October Obliteration... Danny Cavanagh wasn't interested in the challenge though... He only wants to fight Gargantuan, and won't settle for fighting anyone 'lesser'... Cavangh left the arena, and the show ended with Angry Gilmore looking, well, angry, and a little confused! !